The Derbyshire Caving Club was formed between 1959 and 1961 from a section of the Orpheus Caving Club after it had split into a southern part (still called the Orpheus Caving Club) and a northern part (which renamed itself the Derbyshire Caving Club). The first Club newsletter can be read HERE. The Club was started with a membership of about 20, a few of whom are still active in the club. The first year's accounts show a turnover of £14 10s yielding a surplus of £5 17s 3d! In the following years the club steadily grew but much of its interest remained in and around Derbyshire. Towards the end of the 1960s, a younger element entered the club and its members started to undertake expeditions abroad as well as carrying on regular exploration of major UK caves. At the beginning of the 1970s, a few of the members developed their interest in the mines at Alderley Edge by arranging a lease of the mines from the National Trust (in 1969) and re-opening Wood Mine (in 1970). 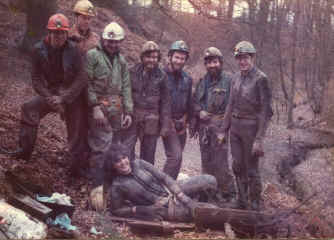 During the 1970s, caving around Britain and Europe and working at Alderley Edge developed together. By 1980, the trend continued as interest in Alderley Edge blossomed and a large influx of members arose. These were mainly people whose principal or sole interest is the exploration of the Alderley Mines. They became known as the Miners! The membership is now around 60 having dropped in recent years, in common with many other caving clubs. However, there is still a healthy balance between the two branches of the sport, caving and mining. This website should give you a flavour of the Club's interests as well as providing enquiry pages through which you can contact us on membership issues, mining or expeditions. The constitution of the DCC is available as a PDF format document.